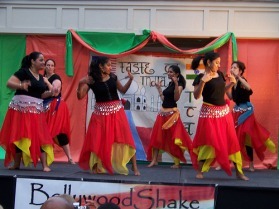 Costume Rental - Bollywood Shake Dance, Fitness & Entertainment - Austin, Houston, Texas & More! Rental fees can be paid by PayPal (to info@bollywoodshake.com), check (made payable to Bollywood Shake) or Credit Card and are also due at the time of pick-up. A $15 processing fee per order will be charged for all rentals. For out-of-town rentals, a shipping charge of $15-20 typically will apply. All costumes must be returned within 3 days of rental pick up. For long-distance rentals, costumes must be shipped back within 3 business days of the event and the tracking number provided. A penalty of $5/day per costume will be charged for any delays. All rentals need 2 weeks notice (especially for out-of-town rentals) or else expedited shipping charges of $40-$50 will apply. The renter is responsible for cleaning costumes before return. If you are unsure or have questions about the cleaning method, please ask the Bollywood Shake representative at the time of your rental. ​​Please note that the costumes are used and some of them may be a few years old. However, they are in good condition to wear on stage and look good on stage. ​All rentals are NON REFUNDABLE once paid and confirmed. All rentals require a deposit, which will be determined during the appointment. A minimum deposit of $50.00 is required. The deposit is due at the time of pick-up. The deposit will be held until all items are returned and their condition assessed. Cash and checks (made payable to Bollywood Shake) are accepted. Damage, loss, failure to return items as scheduled, or unauthorized alteration, will result in forfeiture of the entire deposit. In the event that the repair, replacement or restoration of damaged or lost items exceeds the deposit, the renter is responsible for additional expenses and will be billed for the difference.